Last month members of the NWF Fuels team braved rain, mud and obstacles to take part in this year’s 12-mile Tough Mudder challenge held at Cholmondley Castle in Cheshire. The 50-strong team were brought together through the NWF Group’s ‘wellbeing at work’ scheme which encourages staff to participate in activities with colleagues from other areas of the business. Having been an active supporter of the St.Luke’s hospice in recent years, staff were encouraged to raise funds through Just Giving with a cheque presented to the hospice recently. 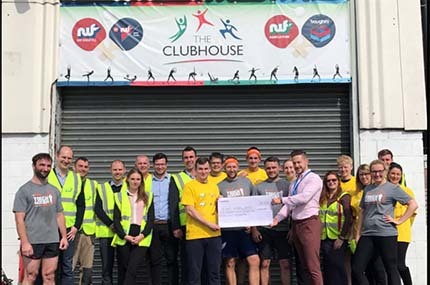 “We are so proud of the team and their fundraising efforts will benefit a fantastic local cause close to our hearts,” said NWF Group chief executive Richard Whiting. WALK, JOG, RUN, CLIMB OR CYCLE – Fuel Oil News has supported some brilliant fundraising efforts for many fantastic causes over the years. If you are raising money for charity, we’d like to help you. For more details please see page 3 in your latest issue of Fuel Oil News.